According to our 2018 Digital Outlook Report, which polled a diverse array of nonprofits across the globe, 48 percent of organizations said they had no strategy for mobile in place or on the horizon. In any case, strategies that consider mobile a secondary concern simply will not do: Nonprofits have to go mobile-first. 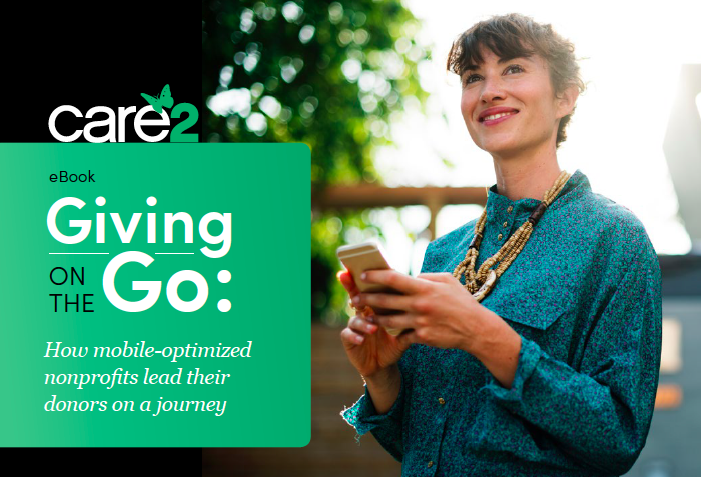 Care2's latest ebook, "Giving on the Go: How mobile-optimized nonprofits lead their donors on a journey," is designed for the busy fundraiser who's getting started with mobile, or who hopes to improve aspects of their mobile journey. Check out an excerpt below, and download the full ebook here! How well users receive and respond to your nonprofit’s story is often tied to the user experience (UX). Clear website navigation, easy task completion and accessible information are among the factors that convince previously nondonating mobile visitors to finally donate. As far as UX is concerned, the simpler, the better. Mobile websites that try to do too much at once are the bane of a mobile user’s existence. Nonprofits need to assess how users move between pages, uncover what they’re looking for and craft UX that helps them finish those tasks. Payment options are also an integral part of UX on a nonprofit’s mobile optimized website. Prominent and vibrant “Donate Now” buttons placed above the fold are essential. And when taken to that donation page, users expect to see a robust selection of payment methods: credit and debit cards, peer-to-peer payments, automated clearing house, international, cryptocurrency, etc. How will you follow up with donors or re-engage a dormant prospect? How often will you notify users about updates about your organization? How will you invite one-time donors to attend events or recruit them for volunteer opportunities? How will you avoid overcommunicating and driving people away? In each case, the answer is mobile. The exact details, however, are up to you and how you decide to leverage mobile in order to drive positive donor outcomes and nurture lasting relationships."